The match began at 4:00 PM. Loyola’s (sponsored by Salgaocar) opened well by taking sharp shots at the goal and putting pressure on Don Bosco’s. Loyola’s opened the score of the match by Samward Pereira scoring a goal in the 16th minute. Don Bosco’s had a couple of near misses but the goal-keeper of Loyola’s, Keanne D’souza, did a great job defending them. The score at half-time was 1 – 0 with Loyola’s leading. The second half opened by Don Bosco’s stepping up their game in an attempt to score. They took a number of shots at the goals but Keanne D’souza did a splendid job defending them. But in the last few minutes of the match Aaron Barreto scored the second goal for Loyola’s in the 50th minute. Loyola won the match 2 – 0. It was a fantastic game with both schools displaying excellent football skills and talent. 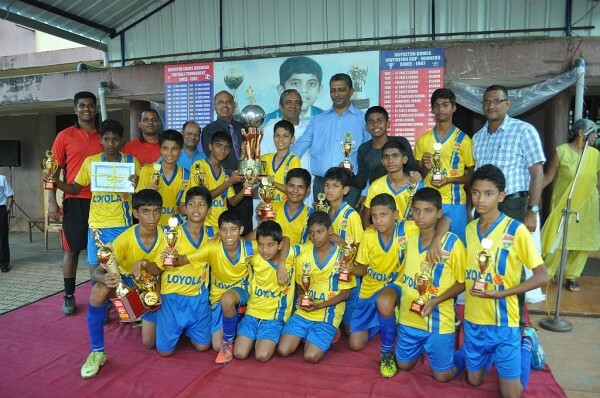 The full jersey and shorts set went to Dnyan Mandir School from Belgaum for the most promising and upcoming School who played the Memorial Cup 2014. Four individual jersey and shorts set went to Mallikarjun Wali of Sant Meera School, Jeevan Shetwe of Oriental School, Affan Savanur of St. Mary’s High School and Aditya Juvekar of Beynon Smith School. The Royceton Committee is grateful to Malcolm and Moses Gonsalves for giving us a chance to recognize young football talent in the city of Belgaum. Aman Govekar, Captain of Don Bosco’s, was awarded the Best Player of the Tournament and Saiesh Kunkolkar of Don Bosco’s was awarded the Best Goal-Keeper of the Tournament. The Highest Goal Scorer of the Tournament went to Aaron Pereira from Loyola High School.